It is the middle of January, 2003 now, and some things have been very slow to take shape at the moment, mail button situation is still not completed, but the "mailme.jpg" image has correct information for now. "RF sale stuff" will soon be seeing a few new production repair pieces; One is a part to replace the piece of a Thorola horn speaker that almost always breaks. One prototype has looked like it will be the final pattern; it is that good, but I am going to try another in order to bring the cost down and simplify machining. If interested in the meantime, to repair your Thorola, or another brand of horn speaker that has a broken part, drop me an email. I may be able to help. I may also be adding a coil winder to the toolroom soon, so re-winding small coils may be offered at some point. Main thrust of the site will still be informational, and admittedly some areas are still a bit thin but- Most of the lamps reference page is up, and while I go through and correct a few button issues on each page, I will try to update and improve each page. Progress is still slower than I would like, but these things happen. For sale items in "RF Sale", and NRF Sale" are basically an online garage sale on those pages too, and they are getting thinned out, as I am helping my parents thin out some of their accumulation as well as some of my own. In the near future I will be adding a "32 Volt" page to cover 32 volt radios, and possibly how to convert them to be able to plugged into 120 volts AC-Either directly (less than a favorable choice for purists), or a simple and inexpensive converter. Also, a substitution method for the expensive type 48 tube that usally get destroyed in pairs when people slap a 120 volt plug onto the cord because they saw that 32 volt plug, which does resemble a 120 volt 15 amp plug. PLUS, a page or two on vintage lightbulbs and Christmas light strings. I am not sure of timeline. On all pages, unless you see the "mailme.jpeg" you will need to change the capitalized words in the email for the symbol, when using the email buttons. ("AT"= "@" and "DOT" = ".") Also please add the leters "adr" to the subject line so the mail program will pick it up as good mail, and not spam. Here are two images of an insert that Raytheon included with their 1926 BH rectifier, which you can substitute the 0Z4 type, or other gas rectifier if you are constructing one from scratch, accordingly- use the tube socket that is required for your rectifier. Top half(1),---Bottom half(2). Silicon diodes could also be used with minimal modifications to the circuit. I will be moving this portion to the "Farm Radios" page, and possibly to the Northome page too, but for now, as I add some new features, I will leave things where they are so I can make sure everything works correctly. There are some changes added this month that are not highly visible at first glance- but progress is still slow. Progress has been slow, and delays have cropped up so I am still not sure of the final timeline until I get it done. "...Many people often mistake "Jet Age" and "Modernism" for "Art Deco", while not taking into account the stagnation that the war brought. By 1946, "Art Deco" was old and "staid", but influenced "French Provincial", The new movement, with the dawn of the "Jet Age" was "MODERN" and "MODERNISM"." From maj.com For current solar weather; or just simply images that will leave you in awe. 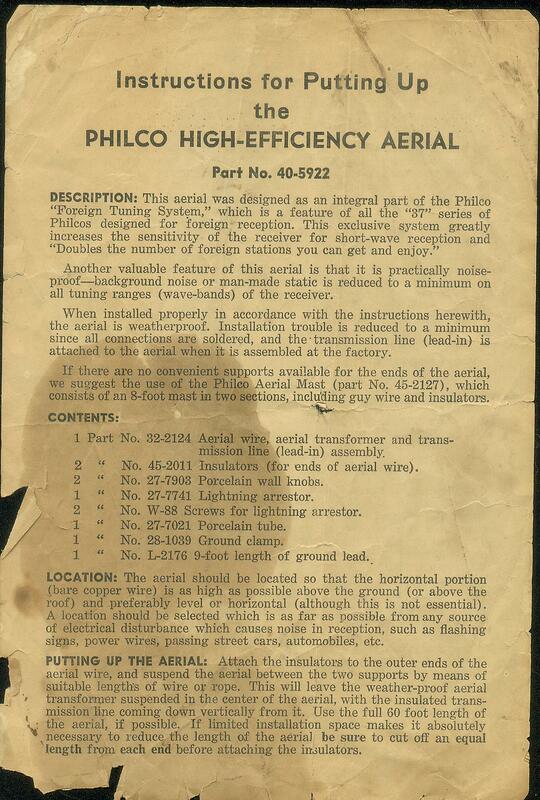 -Philco High Efficiency Aerial documentation. 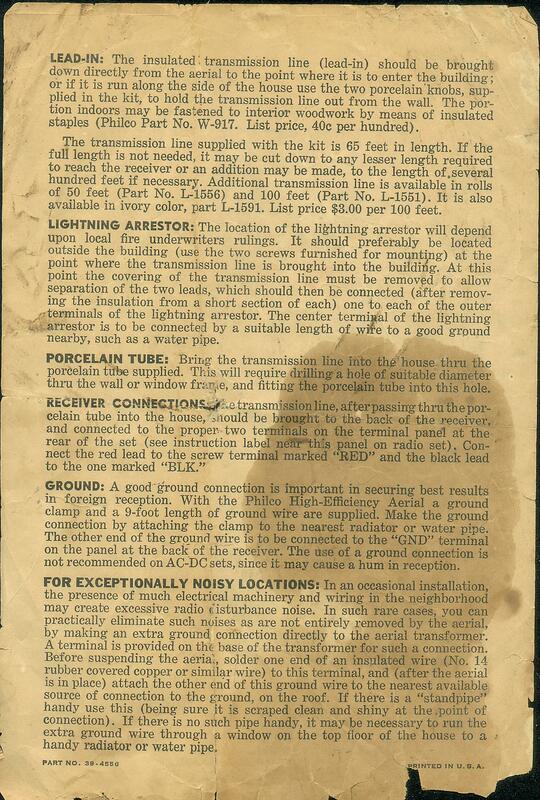 -Philco High Efficiency Aerial installation tips. -US broadcast stations (1936). 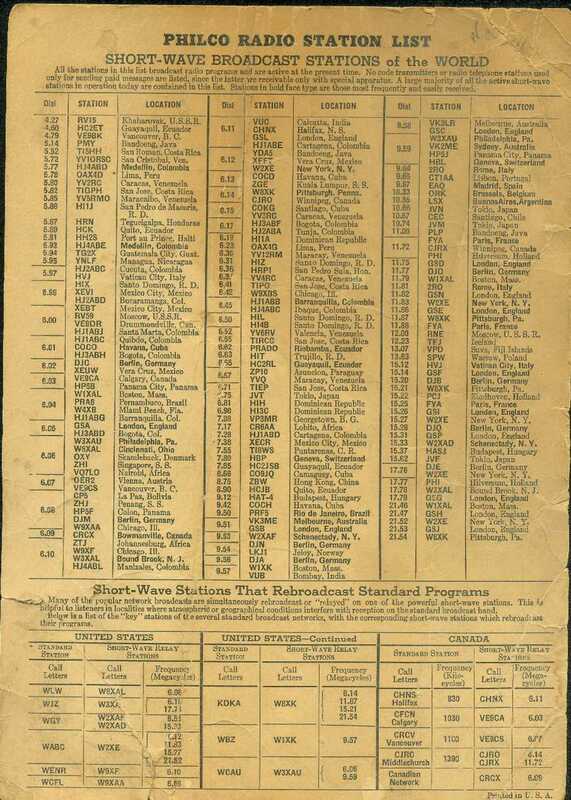 -Shortwave and Canadian stations often heard in US (1936). The Art Deco era was not exactly well defined by certain specific dates other than post World War I, which was in large part- the end of the victorian era. 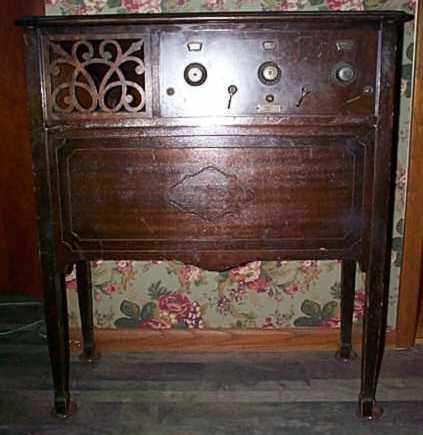 The "Victorian" era; was best known for the influences of "Art Neuveau", which remained in some small influences on some 1920's era console radios. One of the main, but under recognized design influences was that of "Arts and Crafts", and the "Mission" styles. Arts and Crafts embodied much of the design of many houses built in the early part of the century, some structural "details" in larger buildings, and furniture. "Mission" was largely a design trend in furniture, but largely a variant of "Arts and Crafts". Both "Arts and Crafts", and "Mission", are largely outgrowths of the designs of Gustav Stickley, and his brothers, who produced the first furniture styles to be called "Arts and Crafts" and, "Mission". 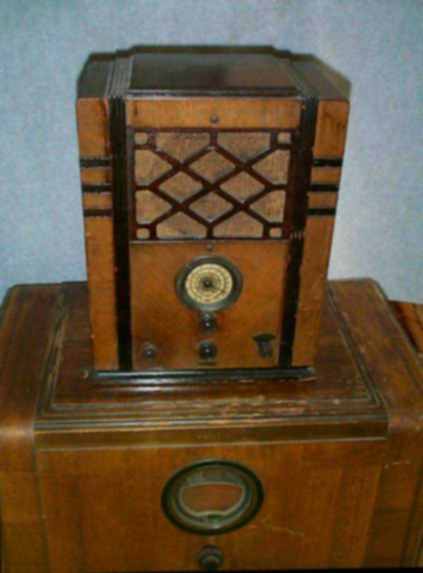 The first radios in production in the twenties fit right in with "Mission" and "Arts and Crafts", with a few items harkening back to "Art Neuveau; usually in details, or ornate leg turnings, as opposed to "Arts and Crafts'" rectilinear geometric forms. 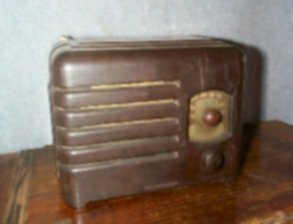 Many radios also happened to built in homes or garages, and some edge treatments were applied to the wood cabinets, most often just rounding the edges over, but even those without adornment would fit well enough into the "Arts and Crafts" home. Bauhaus was also a product of the twenties, and many times "form follows function", also applied to the "Art Deco" lines, but perhaps was a most influential aspect of "Modernism" and "Post-Modernism". The "paper-clip chair" is one such example, it did not see much acceptance until the fifties, where most "Bauhaus" influences were in interior of buildings/rooms. Where it moved outdoors with "Post-Modernism", with the glass panelled skyscrapers that demarkated the "new" architecture from the "old" (aka modernist.) architecture. In today's architecture of the "disposable building", there is little that will be lamented at their demolitions; where instead; we could be moved a bit by the demolition of such noteworthy buildings as the "Dunes" in Las Vegas, Nevada. Even though it was a product of the "Modernist" era when it was built, it was built to be lasting landmark. Will people shed a tear when the "Empire State Building" is demolished? Will anyone even know? Or care? The "high era" of Art Deco was about 1929-1939, but some of the primary elements carried on well past World War II in a much subdued manner in the "French Provincial" designs that started showing up after the war ended, and were also at times a basis for some of the "Jet Age" influences. Perhaps the best two movies to reflect the Art Deco designs at it's peak are: "Wizard of Oz"- The Emerald city. The other movie was "Fantasia", where there were Deco elements throughout. The prominent "Waterfall" and "Aztec" detail found on so much Art Deco desinged items, were incorporated subtly into the backgrounds and the hills in numerous scenes. In more recent entertainment history, Art Deco has appeared in a few animated "cartoon" series on television. There may be more than these two, but, I have not sought them out, nor was I looking for these "cartoons". I have merely happened across them. One is the "Batman" animated series, based on the "Dark Night" series of comic books, (I do not know if I have the correct title listed, if someone knows, please let me know) not the recent variant. Much of the background scenery of buildings exemplifies the "Waterfall" style and decorations that were "High Art Deco Style". The other "cartoon", exemplifies the "Streamlining" influences in Art Deco. "Big Guy and Rusty the Boy Robot." As a whole product, the "cartoon" is not Art Deco, but the head of "Big Guy", is unmatched in contemporary times for demonstrating the streamlining that influenced many things that truly can be labeled as "Art Deco". Other "Art Deco" icons are the "Empire State Building"( New York City), the Foshay tower (Minneapolis, Minnesota), The Cord Automobile, as well as the Chrysler/Plymouth "Airflow" automobiles. The Milwaukee Road "Hiawatha", the Zephyr's of the Burlington Route, and the well known Southern Pacific "GS-4" locomotives that powered the Pacific Coast "Daylights", not to mention the Pensylvania railroad's GG-1 electrics. Diverse influences such as the "experimental" use of asymetry; as exemplified by the wooden 1937 vintage Ward's Airline model 62-324, Also reflected in the speaker cut-outs of the Coronado image below it. These were "new" style additions in this era, and representative of the experimentations of earlier years that became acceptable as design features in the latter years of the era. These diverse influences seemed to rebel from the ornate and flowery decorations of the Art Neuveau style, or the stark simplicity of "Art's and Crafts/Mission" styles. "Shiny", "Streamlined", "bold", "Modern Industrial", "contrasts", are the best adjectives for the era. 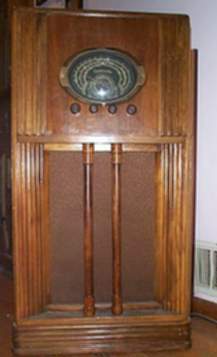 This Coronado radio also reflects the "waterfall front" that helped define the era, with only a slight influence of "Aztec" elements on the sides. The Thirties saw the advent of "streamlining" in the Railroads and aircraft designs by such noteworthy industrial designers as Raymond Loewy*, whose rise to fame came from his first commision with the Pennsylvania Railroad for whom he had designed a waste receptacle. *Loewy was responsible for refining the original design of the Pennsylvania Railroad's GG-1 streamlined electric locomotives; built by the Baldwin Locomotive Works; which ran well into the 1980's in some capacity. Loewy was also responsible for the paint scheme on the Northern Pacific's "North coast Limited" (NP's premier route), which was recieving the new streamlined diesel electric locomotives from General Motors (Now a division known as EMD). Loewy also designed such noted automobiles as the Kaiser "Darin", which was America's first fiberglass bodied sport car in the post-war 1940's. The "Waterfall" front is also evident in this 1936 Coronado console model #1170 (above), and to a lesser extent the "Aztec Pyramid" influence that is exhibited in the Sparton "Tombstone" below. The Sparton also happens to be sitting atop a 1937 vintage Philco Console model #37-670, which also reflects the "Aztec" influences of the Art Deco period. In the twenties; some of the influences within the Art Deco era were Oriental in flavor, with a slight evidence in the design of the Sparton radio below, however they are not as well identified with what we consider to be "Art Deco". 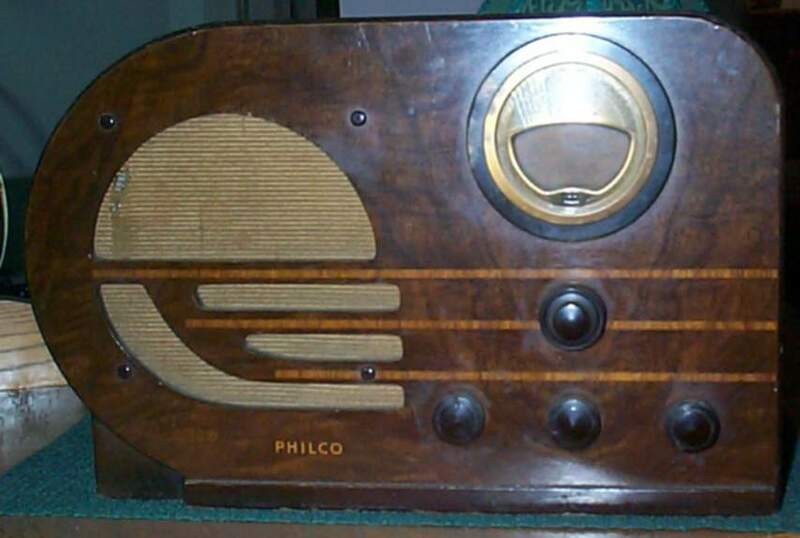 As World War two sought to involve the United States, the Deco influences in the wood radios diminshed, as exhibited in the 1941 vintage Philco Model# 41-100 below, to a point where the main influences of the post war era's "jet age" and "modernism" relegated some of the wonderous designs to ignominy. But the Bakelite radios, which were molded from a liquid plastic compound; Phenyl Formaldehyde; started to appear around 1933 as the complete cabinet rather than just as component panels. This innovation in materials application allowed intricate designs to be molded in Bakelite, or the more lustrous resin plastic- Catalin. The use of plastics for the cases also allowed for intricate designs that were cheaper to produce and this allowed more freedom of design within small budgets. This 1947 Coronado (below), Model#43-8180 (I believe), shows some of the elements remaining from the "High" part of the Art Deco era, but the sound barrier is shortly to be broken by a pilot named Chuck Yeager, which will usher in the "Jet age", and "Modernism", and will be the end of assymetry, silohuette nudes, waterfall fronts, Bakelite and Chrome, aztec pyramids, and the strong industrial designs that made Loewy and a host of other designers famous. Many people often mistake "Jet Age" and "Modernism" for "Art Deco", while not taking into account the stagnation that the war brought. By 1946, "Art Deco" was old and "staid", but influenced "French Provincial", The new movement, with the dawn of the "Jet Age" was "MODERN" and "MODERNISM". This was the era that Frank Llyod Wright had been designing for, for the past several decades. 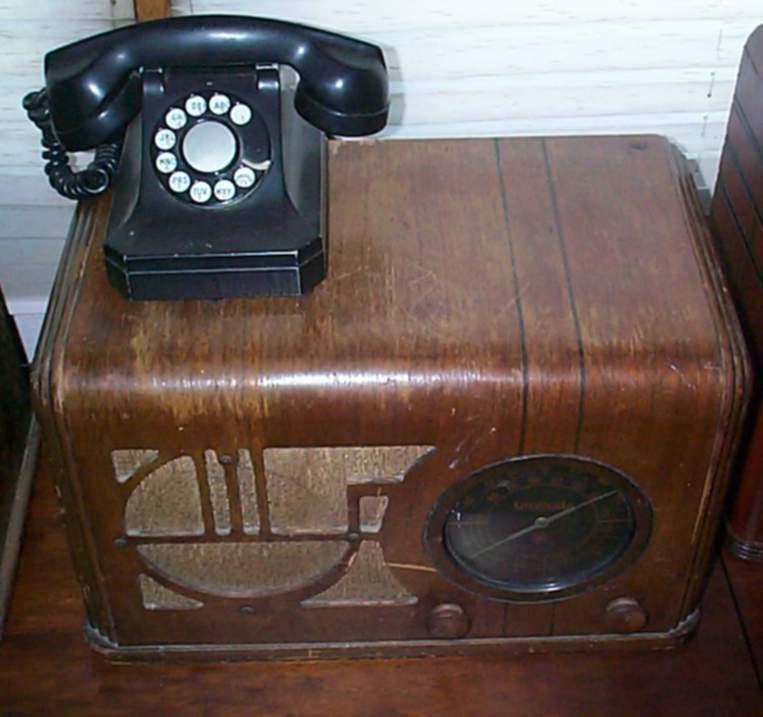 One element of the radios from the Art Deco era that has carried through to some radios, and most stereos of today is the "tuning" indicator. 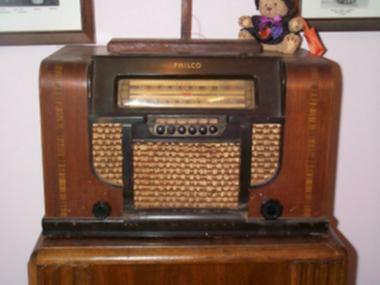 On some radios such as those produced by Philco, used the "Shadow Eye", and on most every other radio of the era- the well known green glow of the "eye" tube. Today's stereos use a simple meter, LED, or LED interpretation of the d'Arsonval movement of the analog meter. 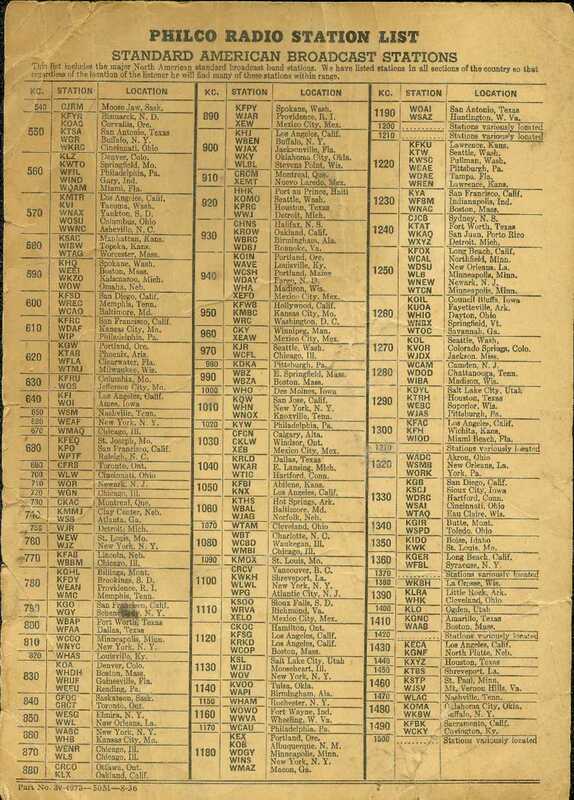 IF someone truly wanted to, they could install a 6E5, or 1629 "eye" tube on one of todays stereos, but it would not have the character of the radios to which this page seeks to preserve some history. 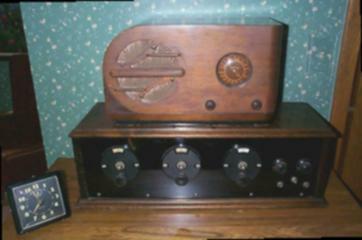 This Antique Radio Webring site owned by John McPherson. Important notes:1) The above radios are not for sale, unless they get listed on the "RF sale page". Other radios, if they are for sale, they will be noted as such. 2) Images on this site are copyrighted, and those that I did not create, I have recieved permission for their use. Any image inquiries can be directed to me via the e-mail buttons. Thank you.
! he likes to spam. !